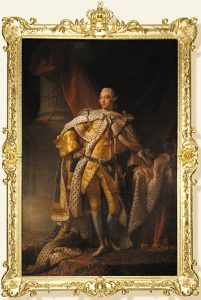 Portrait of King George III in coronation robes from the studio of Allan Ramsay, who served as Principal Painter in Ordinary at the royal court. More than 60 objects destined for exhibit at the American Revolution Museum at Yorktown were on display in “Jamestown’s Legacy to the American Revolution,” a special exhibition March 1, 2013 – January 20, 2014 at Jamestown Settlement. The exhibition examined the lives of Revolutionary War-era descendants of people associated with 17th-century Jamestown, colonial Virginia’s first capital. Work is under way on the American Revolution Museum at Yorktown, which will replace the The American Revolution Museum at Yorktown by late 2016. The artifacts featured in “Jamestown’s Legacy to the American Revolution” – a sampling of those to be exhibited in the new museum – include furnishings, weapons, nautical items, documents, and commemorative objects. Among them are an American-made saber engraved with the owner’s name and the year 1776, a trunk owned by a Continental Navy shipbuilder, and examples of 18th-century Virginia currency. The exhibition opens with “King George III’s Virginia,” illustrated with an eight-foot-tall portrait of the king in coronation robes, one of several done by the studio of Allan Ramsay between 1762 and 1784. From the time he ascended to the British throne in 1760, George III worked to strengthen British administration in the American colonies, with his American subjects ultimately rising in opposition. In pre-Revolutionary Virginia, agriculture and trade drove the economy. A section titled “Merchants, Planters and Farmers” profiles Mary Cary Ambler, widow of Edward Ambler, a wealthy Yorktown merchant and planter, and John Ambler II, their son, and Azel Benthall, a small planter and church vestry clerk on Virginia’s Eastern Shore. The Ambler family suffered serious financial reverses during the Revolution, while farmers like Benthall were better able to cope with wartime shortages. Colonel Richard Taylor, who served with the First Virginia Regiment of the Continental Army, and Captain Edward Travis IV, who served in the Virginia navy, are featured in “Soldiers and Sailors.” Most Virginians who fought in the war were either militiamen or soldiers of the Continental Line. Virginia’s small naval force operated chiefly to keep the state’s rivers and the Chesapeake Bay safe from the British navy and to assist in the transport of supplies for the Continental Army. 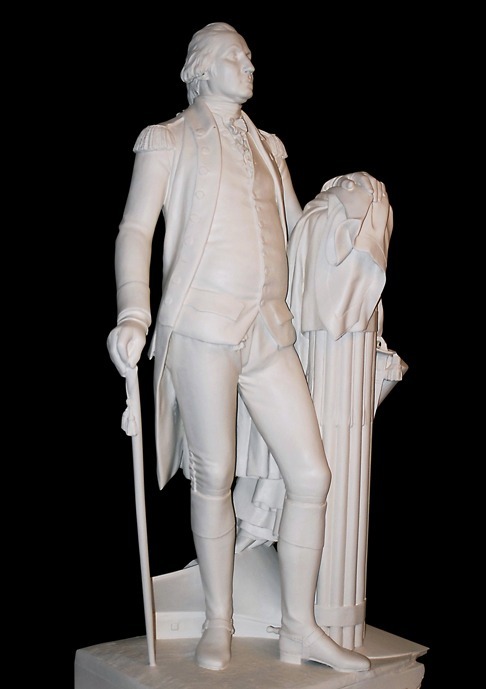 Life-size plaster statue of George Washington made by William James Hubard in the 1850s, copy of a late-18th-century marble statue by Jean-Antoine Houdon that resides in the Virginia State Capitol. Gift of the Library of Virginia. “Statesmen and Diplomats” highlights individuals who supported the Patriot cause and the new nation as public officials. Arthur Lee served on diplomatic missions to Europe during the Revolution and later as a member of Congress. Richard Bland II was actively involved in events leading up to the Revolution, as a member of the Virginia committees of Correspondence and Public Safety and the Continental Congress. During and following the Revolution, General Joseph Martin served as Virginia’s agent for Indian Affairs, acting as a diplomat between the Cherokee and settlers who encroached on Indian lands.The exhibition concludes with an overview of the career of George Washington, whose ancestor John Washington arrived in Virginia in 1656 and later sat in the House of Burgesses at Jamestown. Less than a decade after leading the United States to victory as commander of the Continental Army, George Washington reluctantly accepted the office of the first president of the United States. A life-size statue, made in the 19th century by William James Hubard after an 18th-century work by Jean-Antoine Houdon, portrays Washington as a modern Cincinnatus, the Roman farmer who left his land to fight for his country and, after victory as a general, returned to his farm as a man of simplicity and peace. “Jamestown’s Legacy to the American Revolution” was supported with grants from James City County, Altria Group and Dominion Resources. Artifacts pictured are in the collection of the Jamestown-Yorktown Foundation.